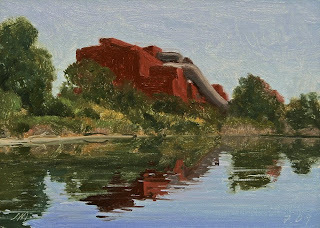 Today's painting is an industrial landscape of the Rouge Plant reflected on the Rouge River. 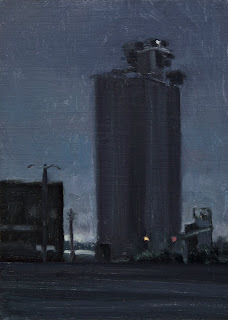 Today's painting is of a nocturne with clouds, watertank and four lights. 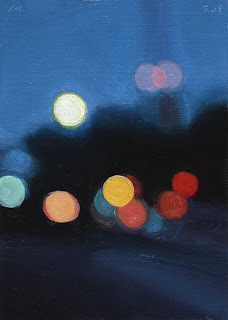 When I saw this sky I thought of the evening sky paintings by Jim Thalassoudis of Australia. 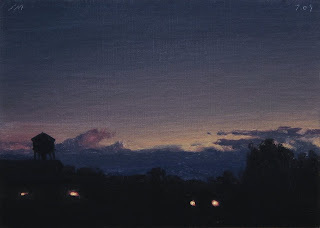 Check out his wonderful paintings of the evening sky. 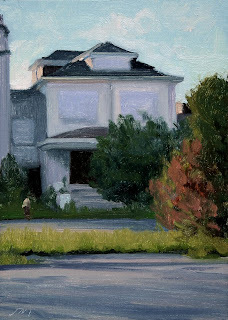 Today's painting is the nineth in the Abandoned Detroit series. 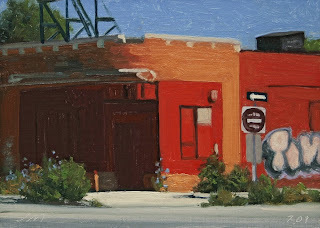 This building is on E. Grand Blvd. 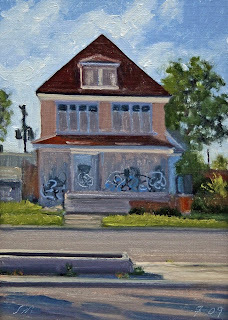 Today's painting is the eighth in the Abandoned Detroit series. 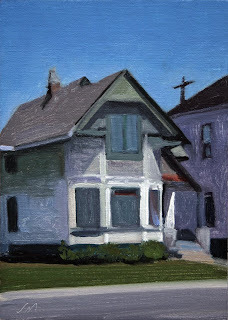 This isolated building is near Woodward Ave. in the midtown area of Detroit. 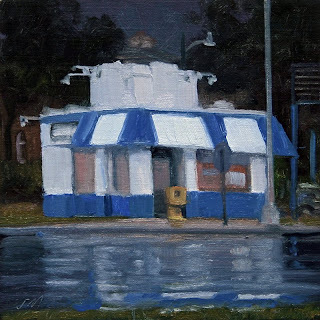 Today's painting is not of Detroit, but is of a scene from my childhood. 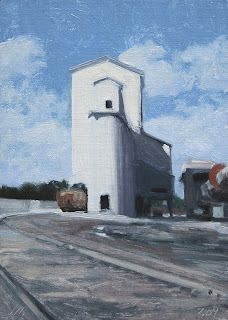 This painting is of the lime plant that my Grandfather worked at, it was about a mile down the road from where I attended grade and middle school. 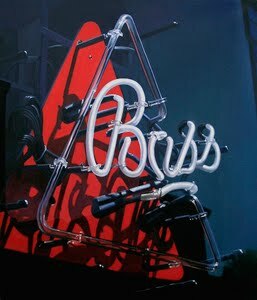 Maybe that is why I like painting Detroit and the industrial scene so much. Early childhood memories. 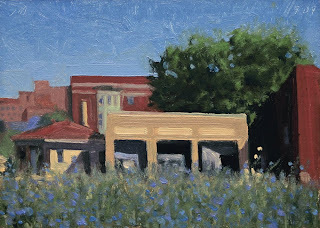 Today's painting is a cityscape of Brush Park buildings with a field of Blue Chicory. Much of Brush Park has reverted back to vast fields of Urban Prairie. 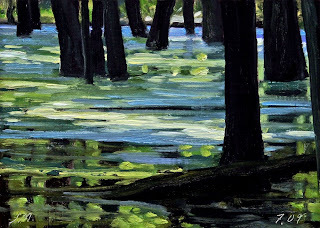 This daily painting is of abstract shapes created by reflections, sunlight and shadows on water in deep woods near Lexington, MI. 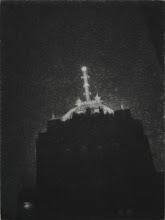 The third in this series. 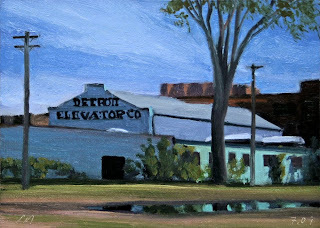 Today's painting is the sixth in the Abandoned Detroit buildings series. One has to wonder what stories this small house could tell. 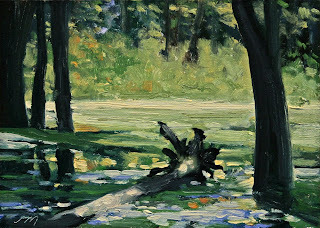 The second painting in the Near Lexington series of landscape paintings. 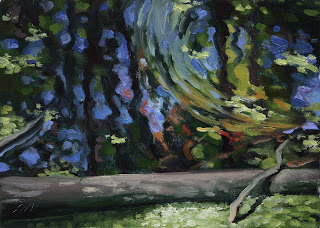 This one is of reflections and ripples on the water. The orange is decaying wood under the water. 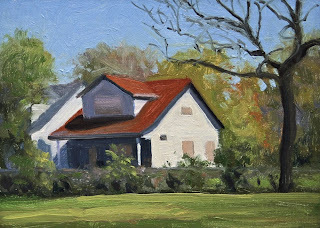 Something a little different for today's painting. I was looking at the book, 'Pioneering Modern Painting: Cezanne and Pissarro' at the Museum of Modern Art, and got inspired to do a landscape with some lush greens, it's not France but still beautiful country. 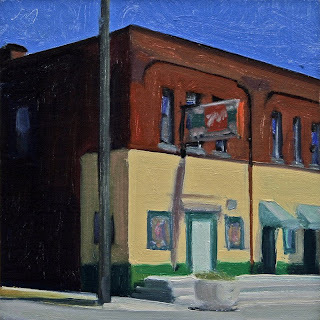 Today's daily painting is of Kovacs Bar on Jefferson Ave in Delray near Great Lakes Steel. While shooting Zug Island I stopped in here for a cold long neck on a hot July day. This area has been hit very hard, it was in bad shape in the 1980's when I did my first photo shoot there, and hasn't gotten any better. 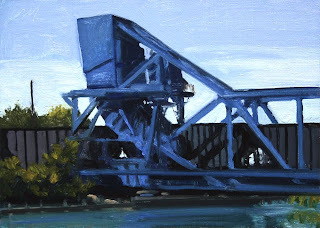 Today's painting is of a wonderful blue RR Bridge at Zug Island. I was able to get some great shots of Zug Island and of the Great Lakes Steel Plant Tuesday so I think I will be doing a series from these. 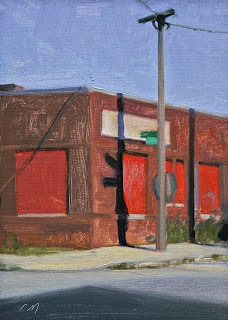 Today's painting is the fifth in the Abandoned Detroit buildings series. There are abandoned buildings and houses, large and small in every area of Detroit. 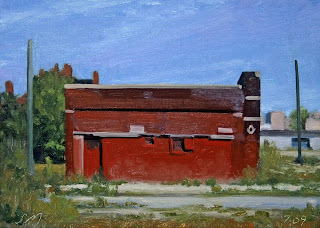 Today's painting is the fourth in the Abandoned Detroit buildings series. 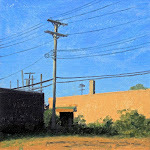 Today's painting is the third in the Abandoned Detroit series. There are many of these single story storefronts all over Detroit. Sadly many are abandoned. 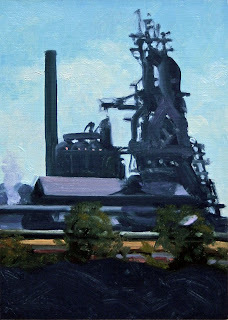 Today's painting is an industrial landscape of Rouge Steel from shots taken a couple days ago. 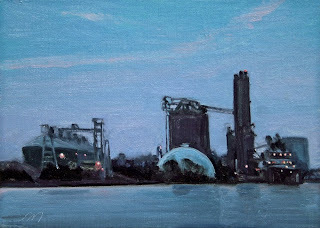 Today's painting is an industrial landscape of the Ford River Rouge Plant from shots taken a couple days ago. This plant always inspires me, it is so vast and complex with so much history of this area. 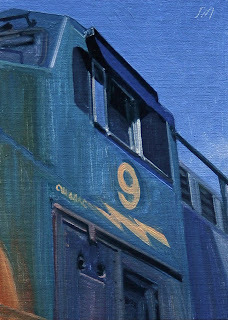 Today's painting is a detail of CSX Locomotive No. 9 at the Ford River Rouge Plant. I got some great shots yesterday before the clouds rolled in. I will be starting a large painting of the drive wheels of this locomotive today. 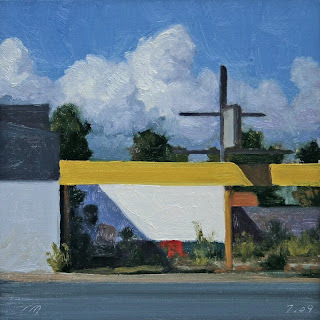 Today's painting is the second in the Abandoned Detroit series. The building in late afternoon sun is on West Grand Blvd. 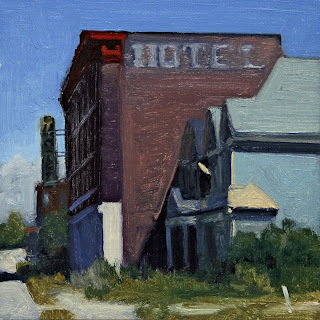 Today's painting is of a Hotel that sits across from the Michigan Central Train Station entrance. 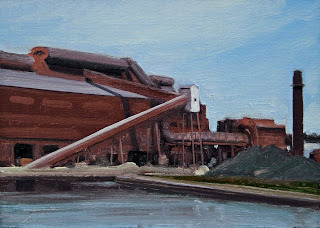 Today's painting is an industrial landscape with a ship loading or unloading on the Maumee River, a study for a larger painting. 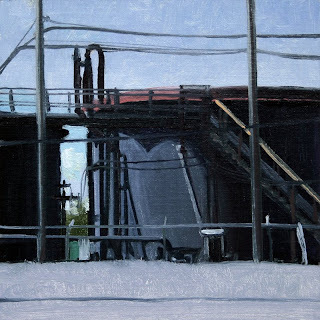 Today's painting is an industrial landscape of two storage tanks with a cat walk. I am a sucker for rich dark shadows set against a high key background. 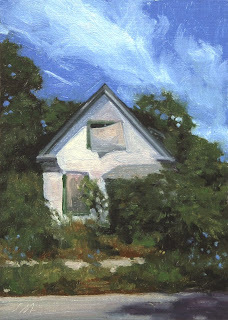 Today's painting is the first of a series of 1oo paintings of abandoned buildings or houses in Detroit. As I am driving around Detroit looking for subjects to paint, I am always amazed at how many abandoned buildings there are. Many of these have been empty for a long time-not just from the current downturn but has this has been an ongoing problem for our city for many years. I may do a book on these images when I finish the project. 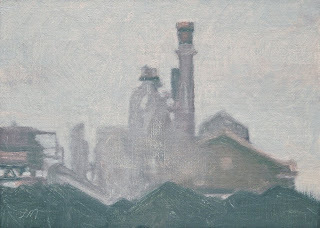 Today's painting is of a Detroit River Monolith, a ghost as it is no longer standing..
Today's painting is of the River Rouge Plant in fog with a little smoke thrown in.